Want to join the drone craze? For a little while, Gizmodo readers can get $35 off the extremely badass DJI Phantom quadcopter with the code "phantom35". Enjoy! The FC40 is amazing. It can beam back live, 720p video to your phone (iOS and Android) via Wi-Fi, while you pilot the drone up to 1/4 mile away. If you take your hands off the controls, the FC40 will simply auto-hover, and it also has GPS built in. This particularly comes into play when the drone's "go home" auto-pilot cuts in, which makes the Phantom return to base when needed. 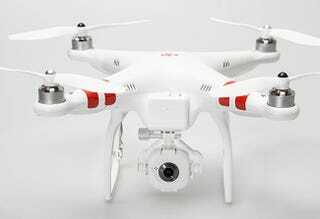 >> Get $35 off the DJI Phantom FC40 – $464 with code "phantom35"
Note: You can get this drone from Amazon and other outlets for $499. But only through StackSocial can you get an extra $35 off (down to $464) using the code "phantom35".